Last Thursday I attended a seminar by the City Planning Department on the subject of introducing townhouses to the city fabric in a larger scale. The seminar was based on the city’s recently published townhouse report (unfortunately only available in Finnish). The report circles – just as the seminar did – around the bureaucratic implications for introducing the townhouse as an element for city-building. It also sums up the current plans for townhouses and the areas with most potential for future development. 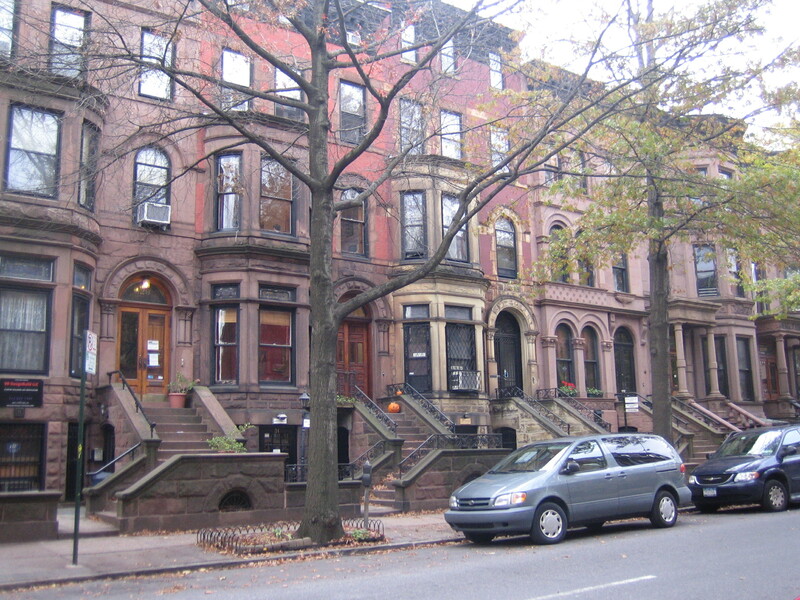 Townhouses in New York City. A significant share of the future townhouses will be built in Östersundom, an unbuilt area in the eastern fringe of the city, and other suburban locations. But some townhouses will also be introduced in the inner city areas. The suburban and inner city townhouse will also be separated as two distinct types. Each will be designed with features that accommodate them in the corresponding context. I find the city’s new plans generally very welcome! Although it’s a bit amusing that something as common as the townhouse is under discussion as an option for city building in the year 2012. But better late than never. Even though suburban townhouses are a better option than detached single-family housing, the seminar gave me the impression that they will in fact only serve as a new way for selling suburban dreams. In other words, there is currently no attempt to use the townhouse as a tool for transforming suburban locations into more urban places. The suburban townhouse will likely follow the examples of existing sites like Säterinmetsä (in Espoo) and Vuorenjuuri. They are among the most notorious examples of the few townhouse-like attempts that we have at the moment. The design keeps people within a distance, no sidewalk by the houses. The inner city townhouses will however be more like the real thing. The ones already planned or under planning will emerge at seaside locations in the brownfield sites of Kalasatama, Jätkäsaari, Koivusaari and Kruunuvuorenranta. It is debatable if the last two of these projects are in fact inner city projects, but that’s how the city anyways sees it. The goal is to spread townhouses amongst taller apartment buildings in the project areas and create nice streetscapes. Cars are parked underground. The city is also thinking if townhouses could be a solution for infill development on lots too small for conventional apartment buildings. I am very pro to these plans and can also say without any further thinking that the townhouse would be a fabulous addition for infill development. Generally, I just fear that the outcomes of the big project plans will turn out to be disappointments. Non-suburban development hasn’t really been done in the city for decades so there is little know-how on placemaking among other things. Extra attention should be paid to making sure the outcome won’t look like Ruoholahti, which is a 1990’s attempt to design an urban neighborhood. Didn’t quite hit the note. It’s as if they tried to squeeze suburban designs into smaller lots. I also took note that the city still needs to define more clearly what a Helsinki townhouse should look like. There was an idea competition for this back in 2010, but apparently more are needed. It would be optimistic to hope for anything but very modern ideas, but I want to remind that the townhouse is not completely new to Helsinki. The very first ones were built 100 years ago in Kulosaari and Munkkiniemi. The ones in Munkkiniemi are designed by Eliel Saarinen. Personally, I would take inspiration from these graceful prototypes. Townhouses in Kulosaari. There are two sets facing each other. The Munkkiniemi houses have quite large backyards. Townhouse, welcome (back) to Helsinki! Keep up the very god works guys I’ve you guys to my own blogroll.